A reader recently mentioned to me that I wasn’t taking the cost of health care with respect to early retirement seriously enough. They were right. 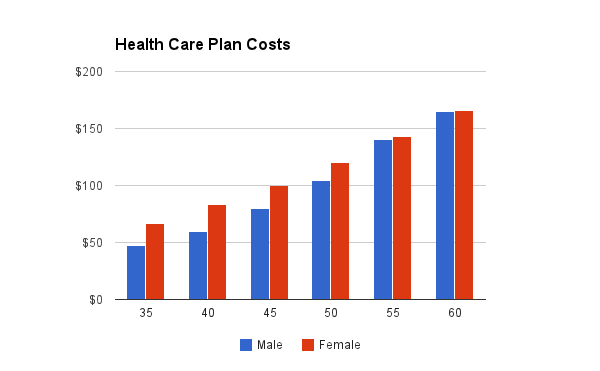 I have written about the fact that if I was around 42 years old today (I’m 34 for the record) and retired, I would be paying $65 to $75 a month for health care. What about when I’m old though, like pants-hiked-to-the-chest and a forest-of-ear-hair old, what about the cost of health care then? Let’s first talk about that $65-$75 health care plan when I’m in my forties. You might be thinking, “Wow, I pay that much a month for my corporate health care plan that’s subsidized. How is that price possible?” It’s quite simple really, and it only involves a couple acronyms. The first acronym is HDHP which stands for High Deductible Health Plan. It’s just like a traditional plan only it has really low premiums – what you pay every month – but in turn has a high deductible, usually running a few thousand dollars. $64.03/mo, deductible of $5,000, 0% coinsurance (pay nothing after the deductible). $72.99/mo, deductible of $3,500, and 20% coinsurance. Now you might be thinking, “A $5,000 deductible! Mr. Everyday Dollar must be insane. I don’t want to pay that out of my pocket!” Yes, I agree with you that a few thousand dollar deductible is a quite a lot of everyday dollars. But then I would ask you if you’re healthy. If the answer is “Yes”, an HDHP is exactly what you want. If the answer is “No”, it probably is a poor choice. If an HDHP is what you’re after then we’ll take advantage of that second acronym, an HSA, which stands for Health Savings Account. It’s a special savings account to use for health care expenses just for people with HDHPs. And it works extremely well to pay the deductible of the HDHP. 1. 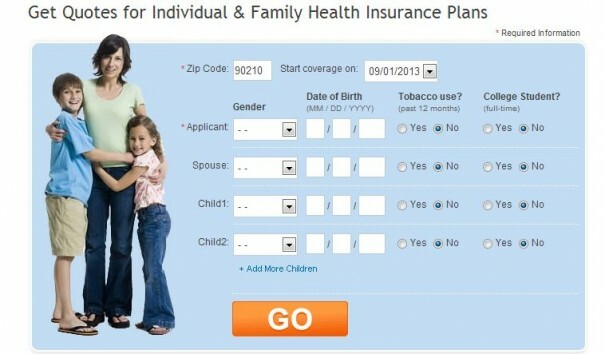 Go to eHealthInsurance.com where you can compare a variety of health care plans. At this point you’ll have a list of health care plans sorted by lowest price. 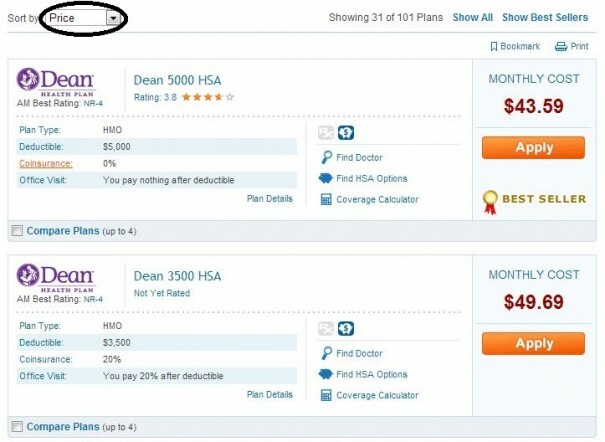 You can choose a plan depending on how comfortable you are with the deductible and coinsurance. I think $5,000 with no coinsurance or $3,500 with 20% coinsurance are both solid choices. Putting money into an HSA is tax deductible. The maximum HSA contribution for 2013 for individuals is $3,250 and for families is $6,450. For an individual in the 25% tax bracket it reduces taxes by $750! HSA money grows tax free from year to year. HSA money can be invested in things like stocks, bonds, mutual funds and CDs (dependent on the HSA you choose). You can keep the same HSA if you decide to switch health care plans. You can earn a measly interest rate, similar to a savings account, with the money you put in your HSA. But if you have a slightly higher risk appetite and don’t want your HSA money to get eaten by inflation you can also invest it. By clicking on the “More Info” link under the Securities Investment Options column on any of the banks, you will see exactly the types of investment options that are available. 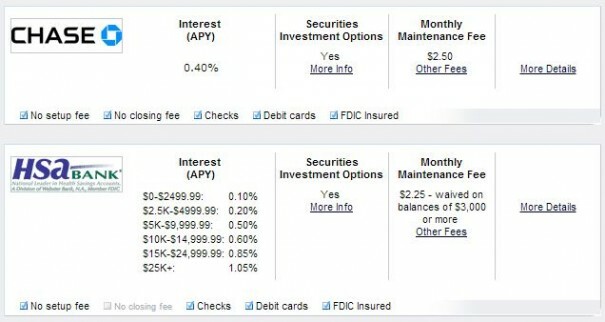 Some banks only offer mutual funds while others offer mutual funds in addition to choices like individual stocks or CD’s. Be sure to note any monthly maintenance fees, and choose a bank that waives fees (altogether or based on a certain balance, and be sure to keep that balance). During the application process for an HDHP is when you’ll make the choice for which HSA you want, so be sure to do your research upfront. Go without a health care plan. A stupid choice because a major medical issue could wipe you out financially. Get on your spouses’s company sponsored health care plan. A solid choice if you have that option. By self-insuring you can expect to pay a monthly premium for an HDHP until Medicare kicks in at 65. The good news is that the cost isn’t all that extreme as we found out. As long as you save and add money to your HSA to cover the high deductible, and stay healthy by eating well, exercising and being of sound mind, you can make inexpensive health care a reality.